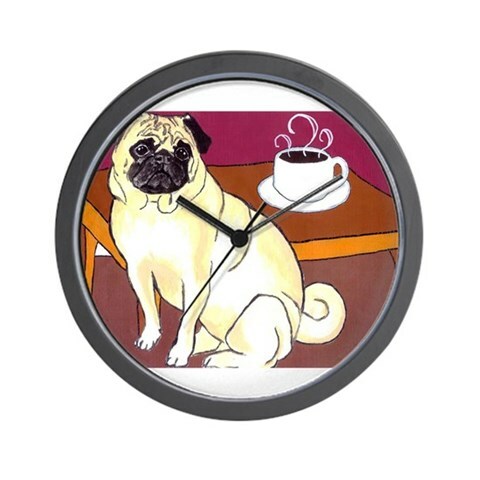 Pug dog design decorative wall and mantle clocks in a variety of styles. Cleverly designed and downright lovable! Made of lightweight wood, the Pug's wagging pendulum tail always brings a smile. Made in the USA. Let this Black Pug Wall Clock remind you of your passion for these wonderful animals time and time again. Designed with precision quartz movement, our 100% American made Black Pug Wall Clock showcases wonderful images associated with the Pug loving lifestyle. This finely crafted wall clock is designed for indoor use, made by the Giclee Printing Process, which provides rich, true to life colors that are fade resistant, and at 10 inches across, it makes a bold addition to any study, kitchen or bedroom. When it comes to displaying your respect for the wonderful Pug, our Black Pug Wall Clock, with a matte finish for an elegant look, are as bold and soulful as the animal they celebrate. 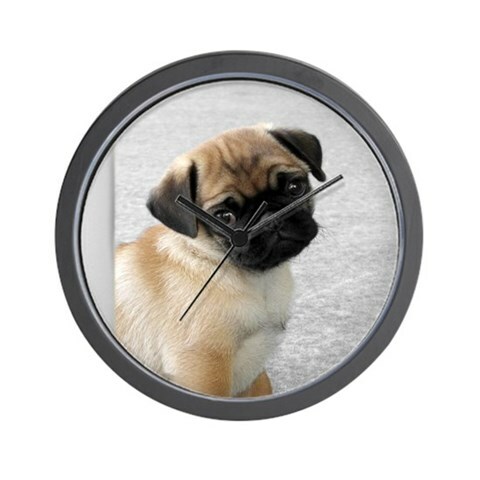 Let this Pug Wall Clock remind you of your passion for these wonderful animals time and time again. Designed with precision quartz movement, our 100% American made Pug Wall Clock showcases wonderful images associated with the Pug loving lifestyle. This finely crafted wall clock is designed for indoor use, made by the Giclee Printing Process, which provides rich, true to life colors that are fade resistant, and at 10 inches across, it makes a bold addition to any study, kitchen or bedroom. When it comes to displaying your respect for the wonderful Pug, our Pug Wall Clock, with a matte finish for an elegant look, are as bold and soulful as the animal they celebrate.